A house on the Art Fort Lauderdale tour. Cultural crusader Evan Snow looked at the art action in Miami-Dade and Palm Beach counties and wondered why Broward wasn’t getting in on the art fair game. 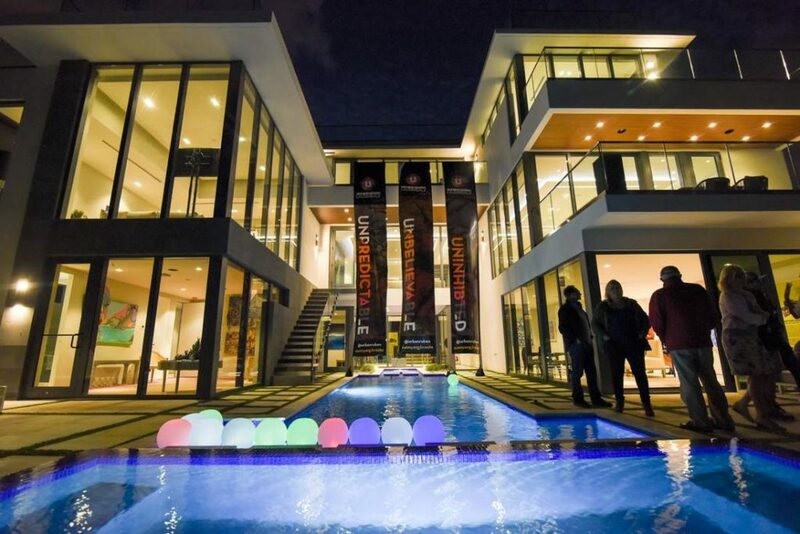 So three years ago he did something about it, fusing the lush waterways of Fort Lauderdale – which give the town its “Venice” nickname – with the many mansions along the water and filling them with art for sale. It’s HGTV meets Art Basel Miami and sets sail. More events have been fused into the month, creating what is now being called Art Lauderdale Art and Design Week. Now in its third year, a slate of art studio tours, dining events, gallery openings and parties brighten up the from today through Jan. 27. Born and raised in Broward County, Snow, who previously worked in staffing and recruiting, wants to help visitors and locals discover Fort Lauderdale’s arts and culture scene. In August 2016, Snow met Andrew Martineau, a 20-year advertising and marketing vet, and discovered mutual interests. Snow and Martineau launched Choose 954 (954 being the local Broward area code), a web-based social media and beyond organization to highlight art and cultural events in Broward County. Choose 954 also offers newsletters, a podcast and weekly roundups of exhibits, parties and happenings. 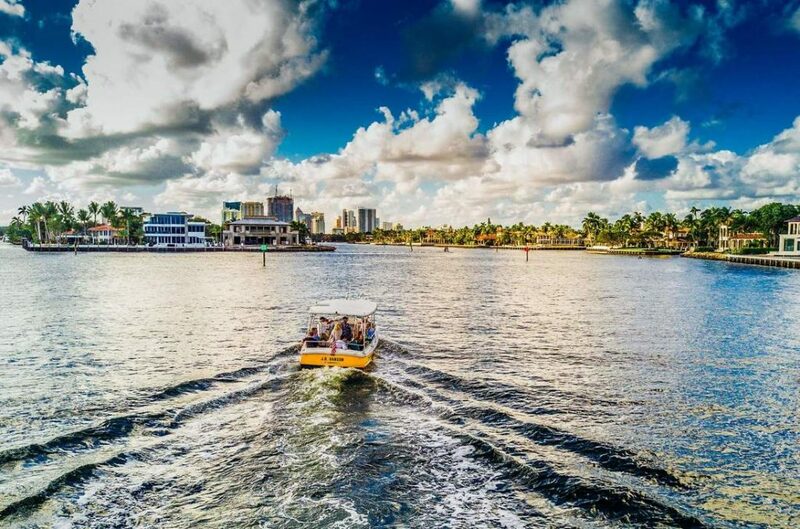 Fort Lauderdale water taxis take fairgoers to homes on the Art Fort Lauderdale tour. 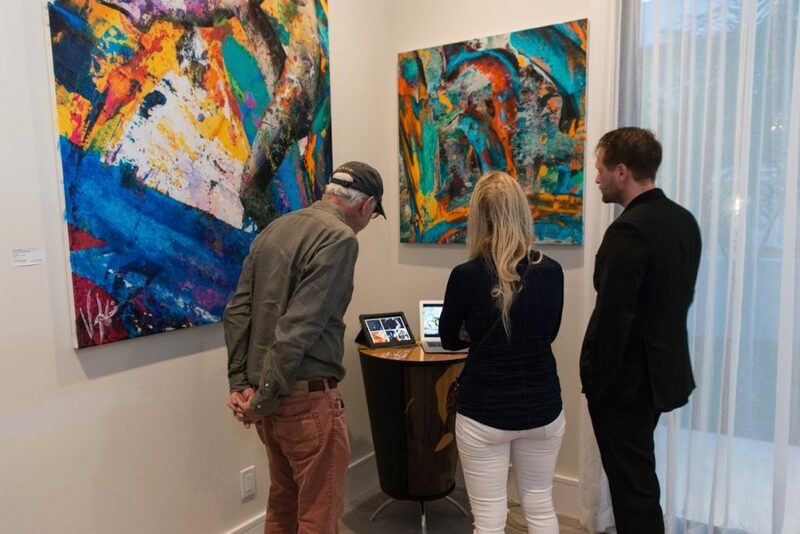 The main attraction is the third edition of Art Fort Lauderdale, the evolving and growing unique art fair along the New River from Jan. 24-27. This “art fair on the water” uses the city’s water taxis to spirit fairgoers to several for-sale multimillion-dollar estates along the New River, which have been turned into curated pop-up art galleries. “We are expecting over 3,000 people,” Snow says. “We moved the main fair boarding area to Pier 66 and have timed departures to make it a more enjoyable experience. We have partnered with the Real Estate Board of Fort Lauderdale, who have provided us with the most exquisite waterfront properties available. We then stage them with designer furniture and the curated art. Fairgoers check out paintings on the Art Fort Lauderdale tour. Unusual art includes Paris art collective Obvious, whose Portrait of Edmond de Belamy was created using an artificial intelligence program. The fair kicks off with a 7-10 p.m. opening party Jan. 23, and the fair’s public hours will be noon-6 p.m. Jan. 24 and Jan. 27 and noon-8 p.m. Jan. 25-26. Sistrunk-A-Fair (Jan. 20-26): Sistrunk Boulevard is the main street running through Fort Lauderdale’s historical African-American community. In the midst of a cultural revival, this weeklong fair highlights the new art and soul of the community with art, films and performances from 25 local artists at the African-American Research Library (2650 Sistrunk Blvd.). Called “We Love Art Too,” the exhibition is curated by Art N Soul’s Al Huggins. Aiming to be part of the fair and revival, and joining the craze for chef-driven food halls and craft breweries, a new hot spot will rise in spring where Sistrunk meets the FEC tracks. Miguel Pilgram, who made his money the newfangled way – he won a $52 million lotto jackpot in 2010 – is investing his millions into Sistrunk, and has plans to open a jazz and blues lounge, NYSW Memphis Blues Spot, along with a new restaurant. B.A.S.E. (Broward’s Artistry N Soul Experience) takes place Jan. 22- 25 at the Old Dillard Museum, highlighting local black artists illuminating Broward’s black history past and present. Work from James Sistrunk, Cannonball Adderley and Esther Rolle will be presented, whose work highlights key landmarks such as The Bowles Strachan house, the farmlands in Pompano, and Attucks when it was the main black high school of South Broward. There will be a screening of the short film Art Beyond the Tracks, about the current African-American art scene in Broward County. Art and Dine Lauderdale (Jan. 19-27): This dining discount deal gives visitors a chance to taste top-tier dishes for less at Fort Lauderdale’s pricier restaurants. Participating restaurants will offer three-course meals featuring signature dishes created at reduced prices: Lunch/brunch priced at $35 and dinner at $39. Participating restaurants include YOLO, Spazio and Café Ibiza. For more information, visit www.ftladw.com.